Crown Princess Mary was at Copenhagen University early in the afternoon to present the Crown Princess Mary Scholarship for 2009. The recipients of the grants this year went to law student Rebecca James from the University of Queensland and another law student, Jeffrey Feng, from the University of Sydney. It looks like Mary's red hair was an anniversary day special - a matter between herself and Frederik! The Crown Princess Mary Scholarship is awarded annually on the couple's wedding anniversary to two students from the University of Copenhagen's partner universities in Australia. Each partner university nominates potential recipients and the University of Copenhagen's partner universities in Australia are: University of Sydney; Flinders University; University of New South Wales; University of Tasmania; University of Melbourne and the University of Queensland (so go for it if you are a student in Australia!). 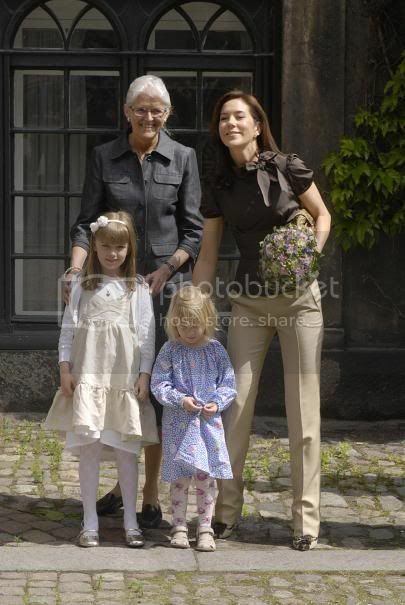 The University of Copenhagen gave the scholarship as a wedding gift to Frederik and Mary in 2004. Congratulations on being awarded the Crown Princess Mary Scholarship for 2009. I know that the University received many strong applications for the Scholarship, therefore you should be very proud of your achievement. It is always a pleasure for me to present the scholarship here at the University of Copenhagen and have the opportunity to meet the worthy recipients. Having a drive to challenge yourself and the world around you, while at the same time having the ability to remain grounded and focused on what is important to you are qualities of great value. I noted that your impressive CV’s also include voluntary work. Rebecca, your work for the aid and development organisation The Oak Tree Foundation and Jeffrey, your volunteer work for university societies and your work for a Sydney community legal centre shows that you both have passion and extra personal resources to want to make a difference. By going on exchange and living and studying abroad you have a valuable opportunity to not only challenge yourself personally, but also develop new skills that will benefit you and others in future. Rebecca, you show a strong interest in international law – which has taken you all the way to Copenhagen to take courses that you have a keen interest in. You also demonstrate a desire to develop your academic skills by participating actively in debating and in moot and negotiation competition. One of your lecturers from the University of Queensland wrote in your reference: “A student cannot achieve such results at this law school without ability coupled with commitment to the task at hand”. Your strong academic achievements and extracurricular activities show that you have the skills and determination to achieve all the goals you set for yourself. Jeffrey, your interest lies in the area of corporate law which is also reflected in your bank internships and your extracurricular activities at the University of Sydney. The corporate world is often characterized by a fast pace in which a sharp analytical mind is required. You show a clear talent to pursue your goals in this area. Your impressive academic skills and your valuable contribution to university society from which other students can also benefit, demonstrates your diverse and strong personal profile. It is a great inspiration to meet students like the two of you who have a strong determination to achieve the best they can and at the same time have a sense of responsibility to help others. I hope that you return to Australia, not only with a more international education, but also with fond memories of your time here and hopefully with some friendships that will one day see you return. It is with great pleasure that I present you with the certificates which show that you have been awarded the Crown Princess Mary Scholarship. Tillykke/Congratulations. I wish you all the best for the remainder of your time here in Denmark and for the future.